Google keeps giving away freebies to customers who buy its hardware. The latest is a trio of free movies from the Play Store for owners of Chrome OS-powered laptops. It's quite nice, but don't head out to buy a copy of Age of Ultron just yet - you get three movies from a relatively limited selection, and they're only in standard definition. So, nice, but not amazing. I'm no movie critic, but I'd say that the clear winners among that limited selection are Mission Impossible, Forrest Gump, and Ferris Bueller's Day Off. 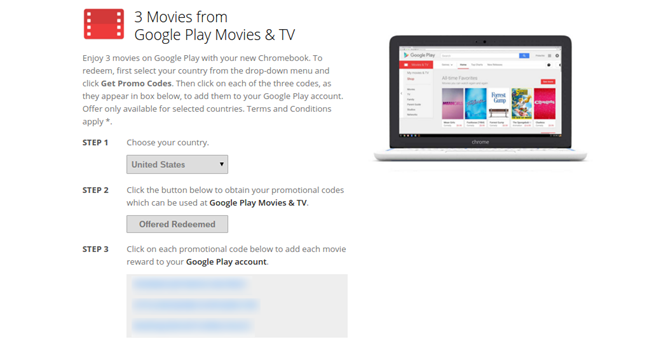 To redeem your free movies, head to this address - you need to be using your Chromebook to get the promotional codes, which you then enter into the Play Store. According to the promotional page, Chromebook purchases between November 8th of this year and January 16th of next year get the free movies, but we've been able to grab codes on much older machines. I bought my Toshiba Chromebook 2 late last year, and I still have access to the codes. So if you have any Chrome OS device, give it a try to get some free movies. [Weekend Poll] Do You Own (And Use) A Wireless Charger For Your Smartphone?